I haven’t posted updates for a couple months. I put the project away just before Passover and it took quite a while for me to get back to it. I started this project on Nov. 23, 2009. 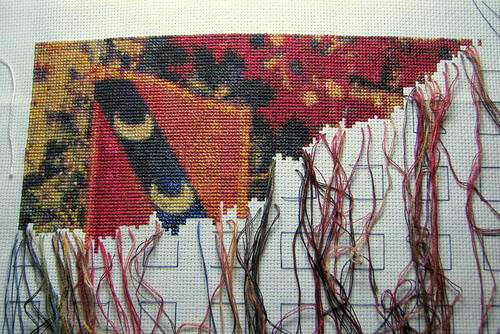 In this photo I’ve completed 5135 stitches. That’s 3.9% of 130,380 stitches. I enjoy working on the flag because there are large areas of red or blue. The mille fleur areas outside the main figures in this design are torture at times! It’s a good thing that I can use the pin stitch for starting and ending a thread. That means that I don’t have to unclamp the frame from the stand and flip it over to work on the back. All the work is done on the front. Sometimes the whole enterprise strikes me as rather quixotic. After I worked for three years on Teresa Wentzler’s English Garden Sampler, I framed it and hung it in my living room. I don’t think a single person has ever commented on the intricate stitching or delicate shading! This entry was posted on May 3, 2010 at 4:07 am	and is filed under Crafts, embroidery. 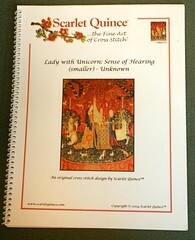 Tagged: counted cross-stitch, cross-stitch, embroidery, lady and unicorn. You can follow any responses to this entry through the RSS 2.0 feed. You can leave a response, or trackback from your own site. Hmmm — 3.9%. That makes ALL of my projects seem like quickpoint. Thanks for the link to your pin stitch pages. I hadn’t seen those before & it looks so useful.